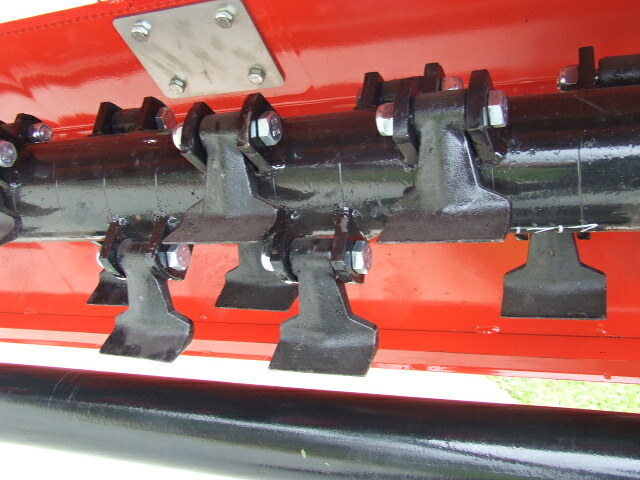 Flail hammer is the plate/blade that assembled to the flail mover using a bolt & nut, which is a type pf powered garden / agricultural equipment, such equipment is used to deal with heavier grass or scrub which can not be removed by normal lawn mover. Flail hammers are attached to the rotating horizontal drum. And the rows of flail hammers are usually staggered to offer a complete cut. If a flail hammer strikes an immovable object, it simply bounces off. Other rotary type mowers have a tendency to grab and throw the object out of the mower deck if its small enough. This fact makes the flail mower best suited for areas where thrown objects would cause damage. Fly company is specialized in supplying forged flail hammers in different sizes. In Eourpean & American market, most popular materials used in forged flail hammers are 42CrMo and 65Mn. By comparision, the price of 65Mn of forged hammers may be more competitive than that of 42CrMo. But as 65Mn belongs to spring steel, it will be very hard to forge flail hammers to final shape. Besides, to meet good durability, heat treatment (normally Quenching & Tempering) will be done to meet hardness 48-52HRC). And surface treatment of such products can be colour painting (yellow/black) or zinc plating, it mainly deponds on the demand of application.